Home > News > Product Knowledge > How to Solve the Failure of the Crusher Reducer? The working principle of the crusher is special, so when it is working, it needs to be equipped with a reducer. In the course of use, the reducer will inevitably have some faults. How to solve these faults correctly? 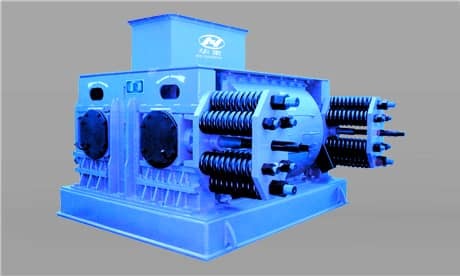 If it is found that the vent hole of the roll crusher reducer is blocked, it should be removed immediately and replaced with a gas cleaning filter. When checking, it is found that the data of the oil pressure, oil temperature and flow rate of the roll crusher reducer is abnormal. It is necessary to clean the filter and the nozzle. After the cleaning is completed, check whether the lubrication is normal. For the bearing of the roller crusher reducer, it is necessary to add an appropriate amount of calcium-sodium-based grease for lubrication when it is reassembled and reassembled, which is about one-third of the volume of the bearing space.